Thank you for visiting Gulf Island Maps. The Gulf Islands are an extraordinary labyrinth of over 6,000 islands located throughout the inside passage between Vancouver Island (the largest west coast island) and British Columbia’s beautiful west coast. Divided into three sections (South, Central and Northern), the Gulf Islands are blessed with mild weather, fair seas, breathtaking views and fertile soil, and are populated with an eclectic mix of merchants, farmers, sailors, artists, musicians, writers and travelers. World-class accommodations, gourmet restaurants and outstanding parks make the Gulf Islands one of Canada’s top tourist destinations. 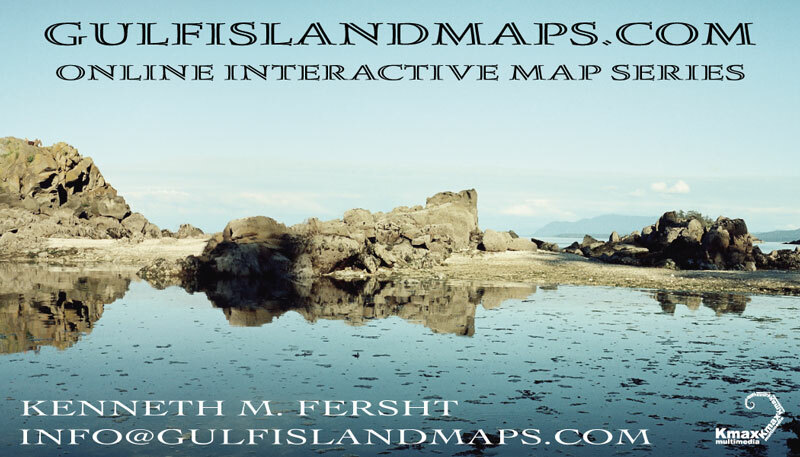 We are creating this series of digital maps to help you make the most of your visit to the Gulf Islands. We hope you enjoy the extensive variety of recreational activities to enjoy for all ages, tastes and budgets, along with the wide array of offerings from our local artists, artisans and merchants. Our shores are full of diversity and amazing things for you to discover. Tidal pools team with life and colour, dramatic galleries of stone emerge from the intertidal zone in some of the most surreal and beautiful formations to be found on Earth. And the scenic mountains, enchanted forests, rolling meadows, miles of beaches and exceptional waterways have something to offer all nature lovers, eco-tourists and adventurers, including scuba diving, whale watching, hiking, swimming, camping and much more. The Gulf is also a mecca for sailors and kayakers alike, who love exploring its protected waters. The Gulf Islands are also a paradise for poets, photographers, painters, and artists of all kinds looking for a retreat from the stress and pollution of life in the city. Many are here for the Nature and to embrace the magical experience of the Islands, which inspire a lot of creative flow. One of our maps is already online and functioning well, that of Salt Spring Island. Pender Islands have just been put online for the purposes of demonstration and getting established in the search engines. The first draft of this map can be found at mapofpender.com. Maps for the other South Gulf Islands, including Galiano, Mayne, Saturna and some of the smaller surrounding islands, are in production at a leisurely island pace. This is a side project, our main gig is web site design and photography and should you be in need of either service, we shall be happy to work with you. Come and enjoy the slower, maritime island pace of the Gulf Islands for a relaxing vacation or adventure experience you will always remember! The Maps are Adobe PDF files. PDF stands for Portable Document Format. These documents are compatible with adobe acrobat reader version 6 and later.For optimal use of the maps, upgrade your Adobe Acrobat Reader to the latest version. The maps are zoom-able to 6400% with no loss of resolution, are searchable, and can be linked to the websites of local businesses and arts studios. One can type in the name of any street or geographical feature, and be zoomed in to that location on the map. One can click on a street name in the street index and be zoomed in to that street on the map, which proves to be a very handy navigational tool. One can also click on a business name in the business index and be instantly linked to that business website. The map will simultaneously zoom in to that business location on the map.The cost for small businesses or studios to have a star on the map and a link in the business index is $80 per year, or $160 per year if you would like your logo displayed on the map itself, which will be linked to your website and/or company info. A third option is to have a customized version of the map appear on your website, which would display ONLY your logo, as well as the best routes from the three ferry docks clearly marked on the map to your location. The cost for this configuration is $240 for the first year, and $160 each subsequent year for subscription renewal. Please note that charities and non-profit organizations are being listed for free, and public wireless hotspots will also be listed in the bookmarks at no charge as a service to tourists visiting the island.The maps will help to promote The Gulf Islands internationally and generate interest in the island itself. I welcome your inquires and feedback on the Map of Salt Spring Island. If you have a bussiness on “Salt Spring Island” or on “Pender Islands” and wish to sponsor one, both, or all of the maps of the gulf islands, feel free to contact me us at info@gulfislandmaps.com. The cost is $80 per year for a star on the map in your location and a listing in the Biz index which links to your web site. $160 per year to get your logo right on the map in your location. If you are in Ganges you will automatically be added to the upcoming high res inset of Ganges also. Kenneth M. Fersht, the creator of this map series has offices on Salt Spring Island and Pender Islands. Kenneth, a.k.a. Kmax, is an accomplished fine art photographer, graphic designer, Web Developer & Musician, that lives in a hole in a tree just up the far side o’ mount Erskine, in the Gulf Islands, British Columbia, Canada. To contact Kmax, click here. or call, yo Ken!!! really loud off the coast guard dock. Kmax is a multimedia artist engaged in custom design work, CMS systems, custom PHP and .CSS, Posters, Flyers, Cards, Logos, Signage, Custom Google Maps and interactive PDF maps for your web site: Expert SEO services verified and guarantied. Let us help you to grow your online business, reach for and meet your goals and dreams. An honest, accessible, highly creative and technically skilled designer of fine web sites, integrated print/web advertising campaigns and much more. Kmax is also, according to some, one of the most innovative lap steel guitarists in the world.